William Abranowicz’s work is found in important collections throughout the world and has appeared in almost every major publication in the United States, Europe, and Asia. He was a contributing photographer to Condé Nast Traveler for 25 years and has created ad campaigns for many leading brands. Zander Abranowicz, William’s son and frequent collaborator, is a writer and editor for the design firm Athletics. John Derian is a découpage artist, home décor dealer, and author of The John Derian Picture Book. "William Abranowicz photographs extraordinary individuals and the unique, personal expressions of style they call home." "A terrific book. . . . something wonderful on every page." 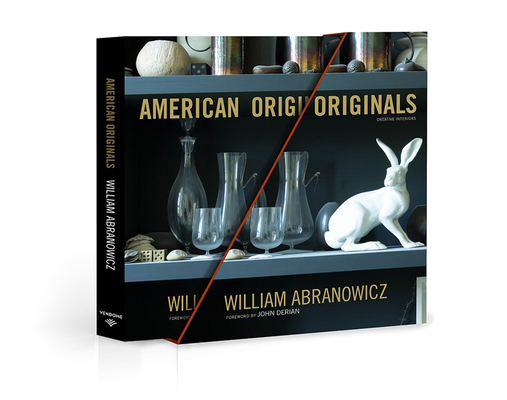 "American Originals is a survey of more than 250 original photos. It's the coffee table book to end it all." "The photographer, long noted for his talent for capturing the essence of rooms and their occupants, has seen a lot and documented a lot. In this new book, Abranowicz focus his lens on the places where poets, rock stars, designers, tastemakers, politicians, and other celebrities live. We see how these luminaries express themselves and their creativity in their rooms." "Flip through virtually any design magazine today, and you'll get an 'inside look' into a celebrity's newly completed home. . . . The photographer William Abranowicz has certainly captured his fair share of these interiors in his 40-year-long career, but he's also managed to stumble across some genuinely striking homes (which often still belong to celebrities) that manage to express something warmly personal about their owners. He's compiled these interiors into American Originals." "Tag along with veteran photographer William Abranowicz to the homes of sculptors, stylists, and actors in American Originals. And be prepared to redefine your idea of creative spaces—these are the real deal." "In the world of interior photography, William Abranowicz is like the Beyonce of his peers--the incredibly talented and highly successful professional that's leaps and bounds ahead of the competition. For 40 years, countless homes of celebrities, painters, poets, rock stars, designers, tastemakers, politicians, and performers have been photographed under his watchful eye."